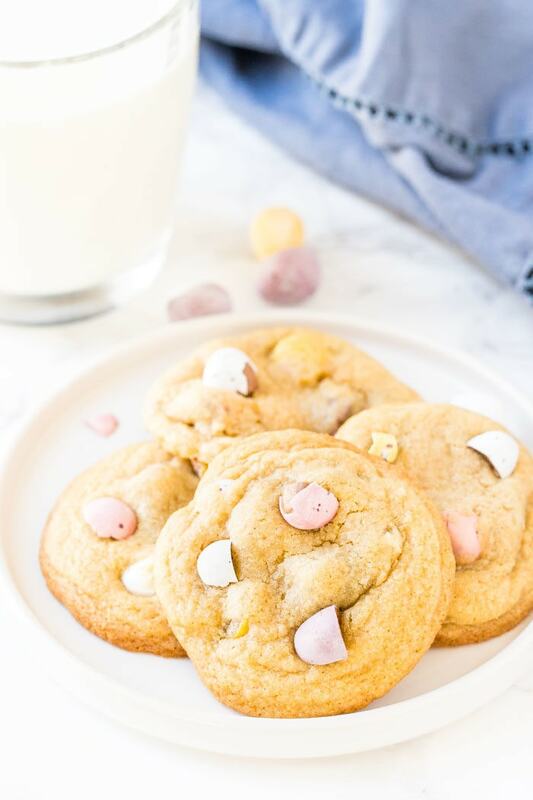 What do you get when you combine Easter candies and chocolate chip cookies??? How about these Mini Egg Cookies! They’re soft, chewy and an easy treat that’s perfect for spring. These mini egg cookies are a delicious Easter treat. We’re basically turning one of my favorite chocolate chip cookie recipes into a colorful cookie for spring. 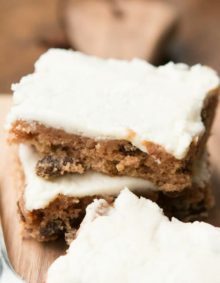 It’s the type of cookie recipe that you can easily make with kids, and you can make them before Easter as a fun holiday activity or after Easter to use up leftover candy. Typically, I don’t really like to buy store bought candy. It’s hard enough already to stay healthy – so I don’t need other treats in the house. But when it comes to Easter candy, I can’t resist miniature eggs. You know the kind that are milk chocolate with pastel colored candy coating??? They’ve always been my favorite. And since they’re only sold around Easter, I don’t feel as bad treating myself to a few eggs. 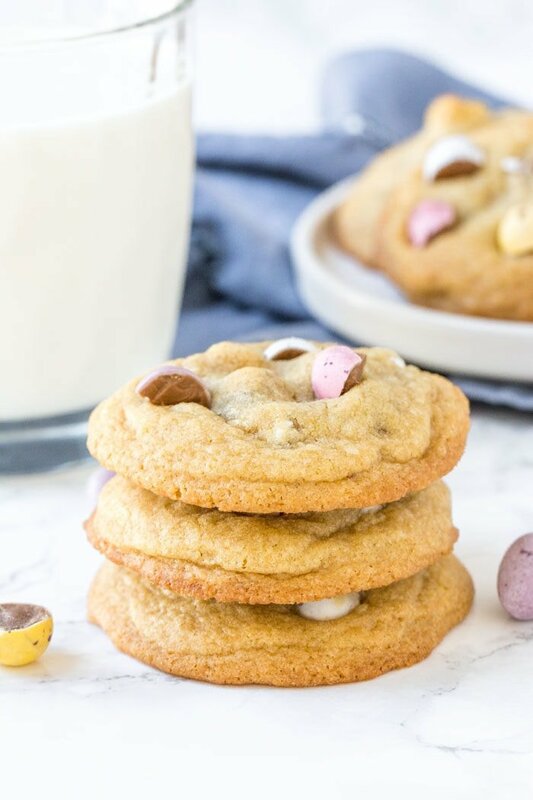 These mini egg cookies are oh so delicious – and I’m sharing with you some of my most common cookie making questions to help you out with your baking! Should You Use Butter or Shortening in Cookies? Butter and shortening are both fats. Butter is a combination of fat, water, and milk proteins, whereas shortening is 100% fat. Butter has a rich and creamy flavor, whereas shortening has no flavor. Because of the water in butter, it melts at a lower temperature than shortening. Therefore, cookies made entirely with butter will flatten out faster as they bake compared to cookies made with shortening. Making cookies with shortening, therefore, helps cookies be thicker, less crispy, and stay softer. 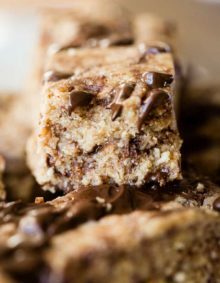 However, because butter has more flavor than shortening – I like to use a combination of butter and shortening in my cookies so you get the best of both worlds. Thicker and softer cookies thanks to the shortening. Lots of flavor thanks to the butter. Why did My Cookies Turn out Dry? Spoon the flour into a dry measuring cup. Level off the top with the back of a butter knife. Or weigh it using a kitchen scale. 1 cup of flour weighs 128g or 4.5oz. Otherwise, if your cookies seem dry, it could be because they’ve been baked too long. I love these miniature egg cookies for Easter. And with all these cookie making tips – I hope your cookies turn out completely delicious and perfect for the whole family! 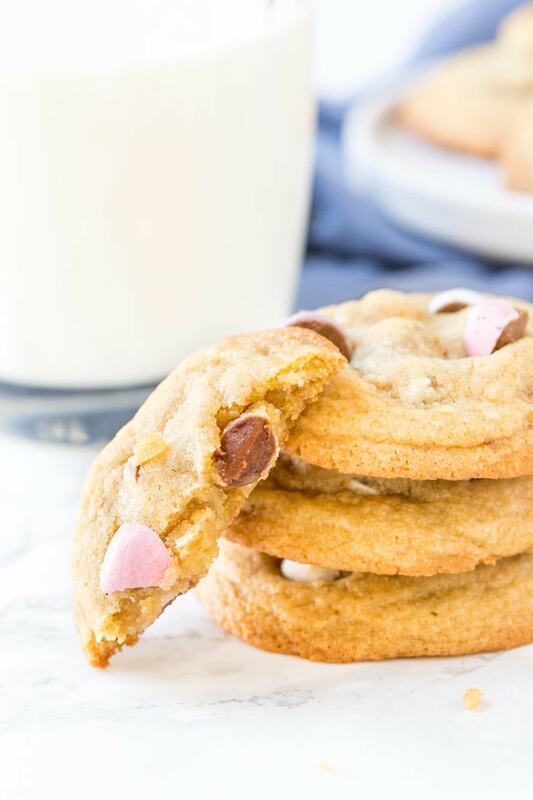 What do you get when you combine Easter candies and chocolate chip cookies??? How about these Mini Egg Cookies! They're soft, chewy and an easy treat that's perfect for spring. In a large bowl beat the butter, shortening, white sugar and brown sugar with an electric mixer until fluffy (about 2 minutes). Turn the mixer down to low speed and beat in the flour mixture about 1/2 at a time. 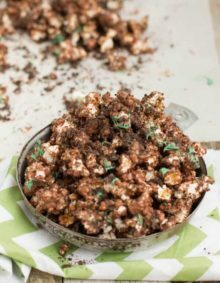 Turn off the mixer and scrape down the sides of the bowl as necessary. 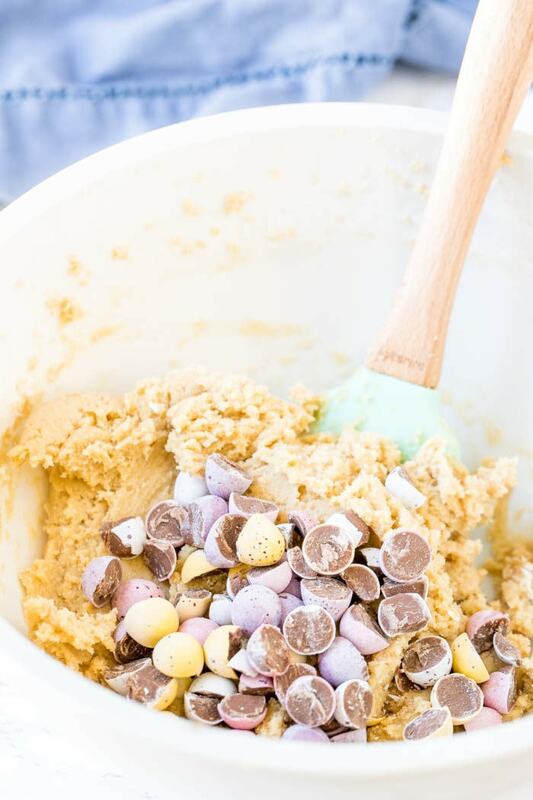 Turn off the mixer and stir in the chopped mini egg candies with a rubber spatula or wooden spoon. From the dough into balls about 2 tablespoons in size and place 2 inches apart on the lined cookie sheet. Ensuring that they're taller than they are wide (this helps prevent spreading). Bake the cookies 1 cookie sheet at a time in the preheated oven on the middle rack for 9-11 minutes or until the tops look just set. Store cookies in an airtight container at room temperature for up to 4 days. 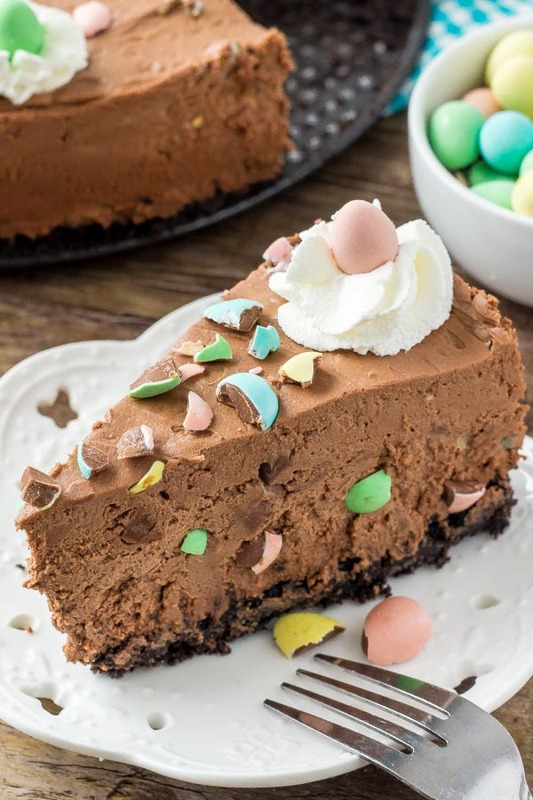 If you love miniature eggs – try this easy, no-bake cheesecake for your Easter dessert! I think it will be so delicious. I love to make many food items. I will try it too. Woow. It looks really great. I want to try it now. Do it!! You’ll love them!